Its that time of year again… the weather is cold and crisp, holiday music is on the radio, and the year is finally coming to an end. For Sage Partners everywhere, this signals the start of the year end closing process for most of your customers. 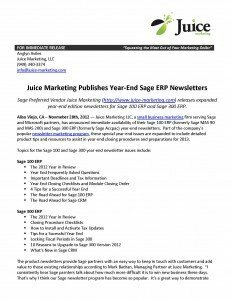 Every year, Juice Marketing publishes expanded year-end edition Sage 100 and Sage 300 ERP newsletters. Packed with product tips and resources, these special year end newsletters help guide your customers through closing procedures and preparations for the new year. Many Sage Partners use these newsletters as a way to reach out to their customers during this hectic and stressful time of year and provide them with valuable year end tools and resources. Juice Marketing is excited to announce that these special year end issues for Sage 100 ERP and Sage 300 ERP are now available for purchase. Click the image below to read the full press release with all the details, and be sure to contact us if you’d like a year end newsletter to send to YOUR Sage 100 or Sage 300 ERP customers.